This Persistence Market Research (PMR) report examines the ‘Global Lithotripsy Device Market for the period 2013–2026. The primary objective of the report is to offer updates and information related to market opportunities in the Global Lithotripsy Devices Market. This report covers the global Lithotripsy Device Market performance in terms of revenue contribution from various segments. The Global Lithotripsy Device Market report begins with an overview of the Global Lithotripsy Devices and its definitions. 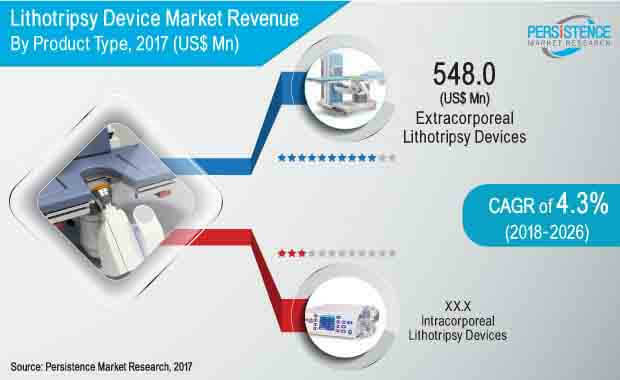 Market viewpoints section underlines macro-economic factors influencing growth of the Global Lithotripsy Device Market along with detailing opportunity analysis of market. This is then followed by key market drivers, restraints and trends. The global Lithotripsy Device Market is segmented based on type, modality, end user and region. Based on type, the global Lithotripsy Device Market has been segmented into intracorporeal lithotripsy devices and extracorporeal lithotripsy devices. A detailed analysis has been provided for each region in terms of market size, Y-o-Y growth rate, absolute $ opportunity, market attractive index. The forecast of Lithotripsy devices by country, type, modality and end user represented in tabular form for each region. This section will provide client to understand the opportunity of Lithotripsy Device Market in major countries by each segment. In the next section of the report, the ‘Competitive Landscape’ is included to provide report audiences with a dashboard view and to access the key differentiators among the competitor firms. This section is primarily designed to provide clients with an objective and detailed comparative assessment of product offerings and strategies of key providers specific to a market segments. Detailed profiles of players in Lithotripsy Device Market are also provided in the report which highlights company description, product/segment overview, SWOT analysis, financial information, key developments related to market and strategic overview. The next section of the report highlights market outlook for 2018–2026 and sets the forecast within the context of the Lithotripsy Device Market by region. Key regions assessed in this report include North America, Latin America, Europe, APEC, China, and MEA. A detailed analysis has been provided for each region in terms of market size, Y-o-Y growth rate, absolute $ opportunity, market attractive index. The above sections – by type, modality and end user – evaluate the historic market analysis and growth prospects of the Lithotripsy Device Market for the period 2018-2026. We have considered 2017 as the base year and provided data for the forecast period. The final section of report representing the global scenario Lithotripsy Device Market along with Y-o-Y growth and market forecast till 2026. This section also evaluates the global market opportunity over the forecast period and also the absolute dollar opportunity for each year. This section will help client to understand the overall market growth of Lithotripsy Device Market and the opportunity analysis for every year over the forecast period. To arrive at the market size, Bottom up approach was used to validate the total market size obtained. The forecast presented in the report provides total revenue of Lithotripsy Device Market over 2018–2026. While forecasting the market size we considered impact of several factors such product approvals Lithotripsy devices, product approvals, penetration of products in different distribution channel, generic penetration across all regions etc. However, quantifying the market across the aforementioned segments and regions is more a matter of quantifying expectations and identifying opportunities rather than rationalizing them after the forecast has been completed. In addition, we have taken into consideration the year-on-year growth to understand the predictability of the market and to identify the right growth opportunities in the global market. Lithotripsy is a medical procedure used for treating kidney stones and stones in other organs, such as gallbladder or liver. Kidney stones usually exit the body through urination, however, sometimes the body cannot pass large stones through urination and may cause bleeding, severe pain and urinary tract infections. Lithotripsy uses sound waves to break large kidney stones into smaller pieces and the most common form of lithotripsy is extracorporeal shock wave lithotripsy. Although not all the kidney stones can be treated with extracorporeal lithotripsy, its relative safety and other cost cutting factors make it one of the most preferred method for the treatment of kidney stones. Intracorporeal lithotripsy is able to treat all compositions of kidney stones and has a high success rate for ureteral stones without any major complications. Increasing prevalence of Kidney Stones is the major factor expected to drive the growth of the Lithotripsy Device Market over the forecast period. Lithotripsy, over the years has become the most preferred method for the treatment of kidney Stones. This has largely been due to the advantage of its relative safety, low cost, less recovery time and positive patient outcomes. Additionally, the intracorporeal lithotripsy devices are able to treat all compositions of kidney stones and have a high success rates for ureteral stones without any major complications. On other hand, lack of innovation and the industry’s interest in funding younger technologies are the major factors restraining the growth of the global Lithotripsy device market. The global lithotripsy device market is projected to expand at a CAGR of 4.3% during the forecast period 2018–2026 and a reach value of US$ 1,095.2 Mn by the end of 2026. The impact of modernized agriculture remains today, and this is reflected by the epidemic in obesity seen in various regions globally. Obesity rate has rose from roughly 15% in the 1980s to approximately 35% in the 21st century. Based on various research articles on kidney stones, there has been an increase in the prevalence of kidney stones globally. Changing life style pattern is believed to be one of the leading factors increasing the prevalence rate of kidney stones. Diminished fluid and calcium consumption have also contributed to the growing number of kidney stone cases. Various epidemiologic studies have also demonstrated that increased sodium and animal protein intake increases kidney stone risk. Therefore, increasing prevalence of kidney stones is expected to fuel the growth of the lithotripsy devices market. PMR report for global lithotripsy devices has been segmented the Based on type: intracorporeal lithotripsy device, extra corporeal lithotripsy device. Based on modality, the global lithotripsy device market has been segmented into standalone and portable lithotripsy device. Based on End User, the global Lithotripsy Device Market has been segmented into hospitals, ambulatory surgical centres and specialty clinics. The global lithotripsy device market has been segmented into six major regions, namely North America, Latin America, Europe, Asia-Pacific excluding China, China, and Middle East & Africa (MEA). Europe is expected to be a dominant market in the global lithotripsy devices market due to presence of key market players in the region. The Asia-Pacific excluding China market for lithotripsy devices is expected to account for second large value share followed by North America. Asia Pacific and Europe collectively expected to constitute for around 50% of the market share over the forecast period. MEA and Latin America are expected to be fast-growing regions in the global lithotripsy device market due to growing healthcare spending. Examples of some of the key players operating in the lithotripsy device market are Dornier MedTech, Allenger, STORZ Medical, Lumenis, ms Westfalia, MTS medical, Direx Group, Medispec Ltd. GEMSS Co., Ltd., Richard Wolf, EMS Electro Medical Systems, Walz Elektronik GmbH, Boston Scientific Corporation, Beijing SODY Medical Equipment Co.,Ltd., Apex-MediTech, etc.